I began working with Karen in August 2012. Like so many working parents, Karen found it difficult to make time to exercise. Prior to training here, Karen taught pilates, took spinning classes and ran on occasion. During our initial consultation, it was agreed that we needed to find the most time efficient methods in order for Karen to reach her fitness goals. Luckily, she came to the right place! 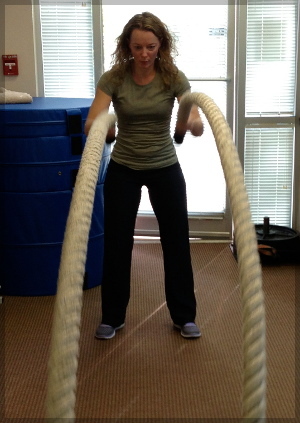 Karen was new to strength training; however, she quickly picked up the basics. She soon became one of the strongest female competitors at the studio. After finishing the Prowler sprint in record time, I knew nothing would stop her from achieving her best. Karen always shows up on time and is ready to work – no ifs ands or buts. Her attitude and strong spirit are extremely uplifting. Based upon her dedication and for her willingness to try so many foreign training methods, I’m pleased to honor Karen Peterman as our client spotlight. Keep up the good work and here’s to you!